The Digital RCD tester is capable of testing a large variety of RCDs and features an auto ramp function. Designed to comply with an IP54 rating, the MRP 201 is comprised of a custom microprocessor to achieve high accuracy and reliability. The SONEL MRP 201 can test a large variety of RCDs including standard, selective, AC and A(DC sensitive breakers) RCDs, with a digital read out of trip times and auto ramp function available. Containing a custom microprocessor to achieve high accuracy and reliability, the MRP 201 model also has a 0 and 180 phase angle switch, permitting quick testing and allowing for consistent readings. Accuracy is also maintained by the constant current source circuitry, which ensures that a fluctuating mains voltage does not affect readings. 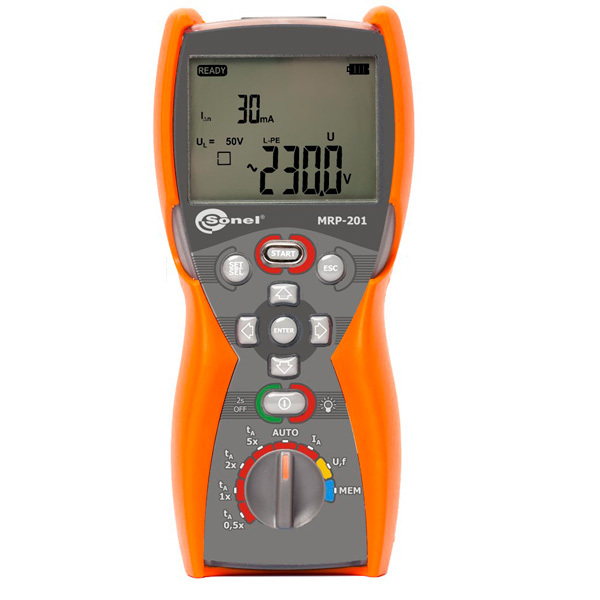 The SONEL MRP 201 possesses a large custom digital display and is supplied with moulded plug test leads, cord case and shoulder strap.